Joico K-PAK Smoothing Balm A heat-activated blow-dry styling tool that conditions,..
OSMO - EXTREME EXTRA FIRM HAIRSPRAY - 500mL A fast drying volumising hairspray for.. The secret to achieving relaxed, just ‘off the beach’ styled hair. This fine mist spray creates a.. Shapes your hair with pliable texture and definition and soft shine. 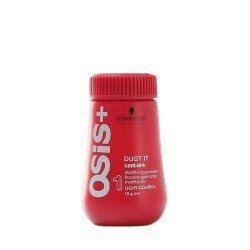 DI..
OSiS Dust It - Schwarzkopf Professional A Mattifying Powder that lets you create styles .. Welcome to Headmasters for hair. Our colors are 'ammonia free' with organic and natural ingredients, this is a superb and amazing product, which will give your hair a beautiful glossy shine. "Color Herbe" is free from harmful chemicals and is non-toxic, it is a completly safe way to color your hair, for both you and our environment! These amazing colors are also totally safe to use whilst pregnant, 100% grey coverage on all hair types, and leaves your hair with incredible shine and condition at a great price! 20% OFF HAIRCUTS FOR FIRST TIME CUSTOMERS!!! Haircuts available for Men, Women and children. Phone today for an appointment time that suits you.